When I was a kid, my parents took me to a restaurant where you were not only allowed to throw peanut shells all over the floor. You were actually encouraged to. Sure, it may have just been a marketing gimmick, but to a kid, it was totally awesome! And, in fact, shelling nuts is actually a great activity for young kids. Though you probably don't want to recreate the full "throw it on the floor" experience, having kids shell nuts helps build fine motor skills and is just as awesome today as it was in my day. Ready to build your own nut cracking station? To start, you'll need a big tray with a tall lip to be the work area. The lip will help keep the work contained while the large size gives the children a wide range of motion. Next, you'll need a nut cracker (like in the photo). And, of course, you'll need nuts. Peanuts are best though pistachios are also a good one for beginner nut cracking. For a younger child, pre-crack the shells so they are still challenging but doable. Now that you've got the station set up, it's time to let the cracking begin. And here's why it's an excellent Montessori fine motor skill activity. Take a look at the photo. See the pincer grip necessary to get those shells open? That's what you're looking for. 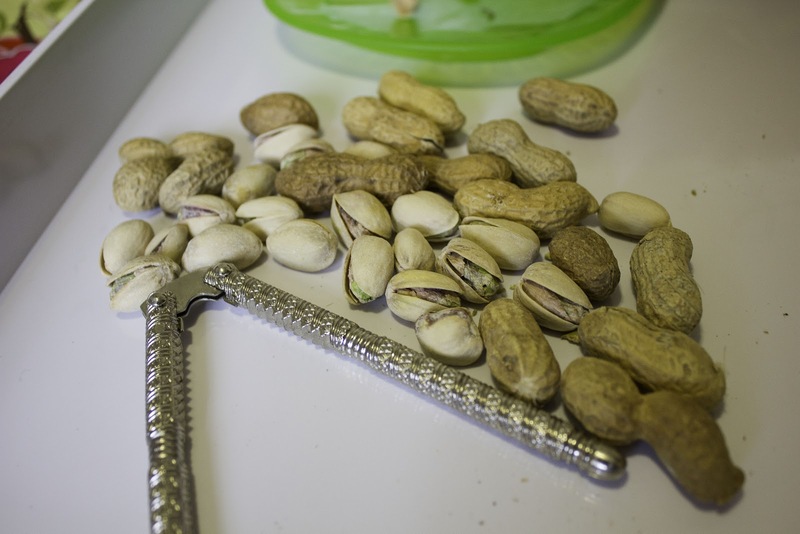 The actual nut cracking tool gets used on the harder shelled peanuts. It's there if you need it or want it, but my kids mostly just use their fingers, which is better for them anyway.